One thing most people get confused about regarding fitness is the distinction between reps and sets. They’re used everywhere: workout plans, gym signs, fitness websites, iPhone apps, everywhere. And despite their ubiquity, it’s easy to gloss over the fact that we were all complete newbies once and had no friggin’ idea what any of that stuff said. 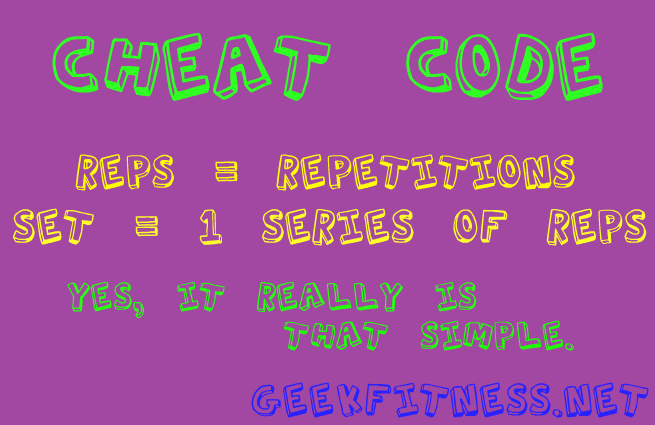 So this Cheat Code is to help you folks understand just what the heck we mean by sets and reps.
Standard Definition? No HD here! The term rep stands for repetition. One simple movement that is repeated over and over again within a workout. For instance, a single sit-up, one pull-up, or a burpee would each be considered 1 rep, respectively. A set, then, is a set of repetitions. That is to say, you might do 50 sit-ups as a part of your workout, but not all at once. You could do 5 sets of 10 reps, or 10 sets of 5 reps, or any combination thereof. Any group of reps would be logged as a set. And to complete the video game metaphor in the Cheat Codes series, you can think of reps as individual levels, while a set is the game itself. You beat World 1-1 through 8-4 (individual reps), which are all contained in a single set called Super Mario Bros. If a rep is a sub-level (1-1, 1-2, 1-3, etc. ), then a set is a full level and a complete workout is the complete game. How about that?